A variety of fruit trees grow well in North Carolina’s mild climate, including apple and pear trees. However, while peaches thrive in the state’s lower elevation areas, they do not grow well in the state’s higher elevations and cooler temperatures. Once you’ve planted the trees that work best in your garden, maintain them, then get ready to enjoy the tasty fruits of your labor. While apple trees grow well throughout the state, most apple trees require another tree for cross-pollination in order to bear fruit. If you prefer sweeter, showy fruit, choose from varieties like Jonagold, Red Delicious and Yellow Delicious. For tart, crisp-fleshed apples, choose varieties like Fuji or Gala. Plan on planting apple trees away from buildings and fences to help protect them from cold air pockets trapped by these structures. 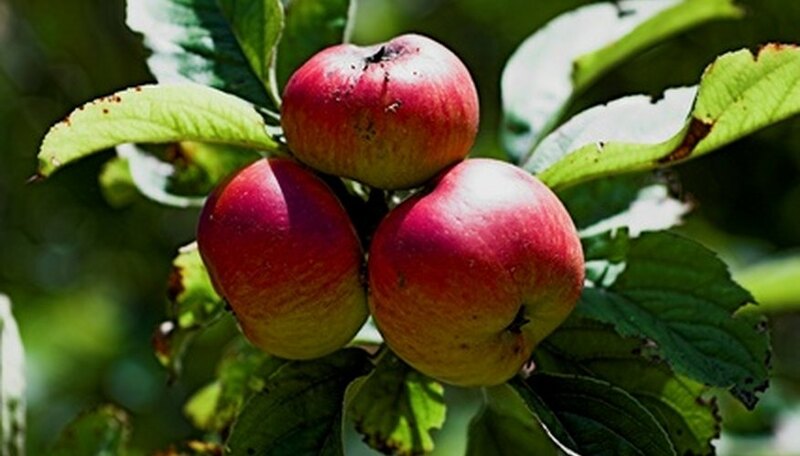 In the late fall to early spring, plant your apple tree in a sunny location in well-drained soil, watering it regularly until the tree is well-established. Since peach trees can handle fairly cold weather, they grow well in all parts of North Carolina except in the mountains. You also need to avoid planting them in areas that form pockets of cold air. Gardens with limited space may find peach trees an ideal fruit tree since they are self-pollinating, so do not require another tree to set fruit. Choose from verities such as Redhaven, Norman, Carolina Belle and Cresthaven, among others–these all grow well in the state. Plant peach trees after Thanksgiving until early spring with early winter being the best time to plant. Plant the trees in full sun in well-drained soil, and regularly water until the tree is established. A variety of pear trees that grow well in all areas of the state give gardeners plenty of choices for delicious late summer or early fall fruit. Many gardens already feature Kieffer pear trees, producing a rough fruit used for jams, preserves, canning and fresh eating. Other varieties include Barlett, Moonglow, Magness and Seckel, a small pale brown fruit with superb flavor. Since pear trees tend to bloom before the danger of frost has ended, plant the trees in areas of the garden that sit higher than the surrounding areas. Make sure the location receives full sun with soil that is well drained.